Mosquitoes are more than just annoying – they can carry serious diseases that can affect you, your family, your pets and your livestock! Arbovirus is a term used for a group of viruses transmitted by arthropod vectors such as mosquitoes. In Texas our concern includes West Nile virus, St. Louis encephalitis, Eastern Equine Encephalitis, Western Equine Encephalitis, Dengue virus, La Crosse Encephalitis, Chikungunya virus, Rift Valley Fever virus and Zika virus. Learn more from the CDC about the Zika virus transmission and specific health and travel precautions here. Anyone can get an arboviral infection, but young children and the elderly may be more susceptible. Most arboviral infections are spread by infected mosquitoes, but not all mosquitoes have these viruses. Only female mosquitoes will take a blood meal and have the potential to pass along the harmful viruses. Migrating birds may aid in transmitting disease but humans cannot become infected with arboviruses directly by birds, only by mosquitoes. Note that while some jurisdictions participate in collecting and testing dead birds in order to track these diseases, Hays County does not. For more information on dead bird testing, visit this Texas A&M University pdf. Most infections do not result in any symptoms. Symptoms may occur days to weeks after a bite from an infected mosquito. Health care providers can provide supportive care but there is no specific treatment available for arboviral infections. Mild cases may occur with only a slight fever and/or headache and body aches and resolve with no complications. Severe infections are marked by a rapid onset, headache, high fever, disorientation, tremors, conjunctivitis, convulsions, meningitis, encephalitis, flaccid paralysis, coma or death. There have been reports of a link between the Zika virus and birth defects such as microcephaly and between the Zika virus and Guillian-Barré syndrome. What should I do to prevent mosquitoes and in turn, infection? 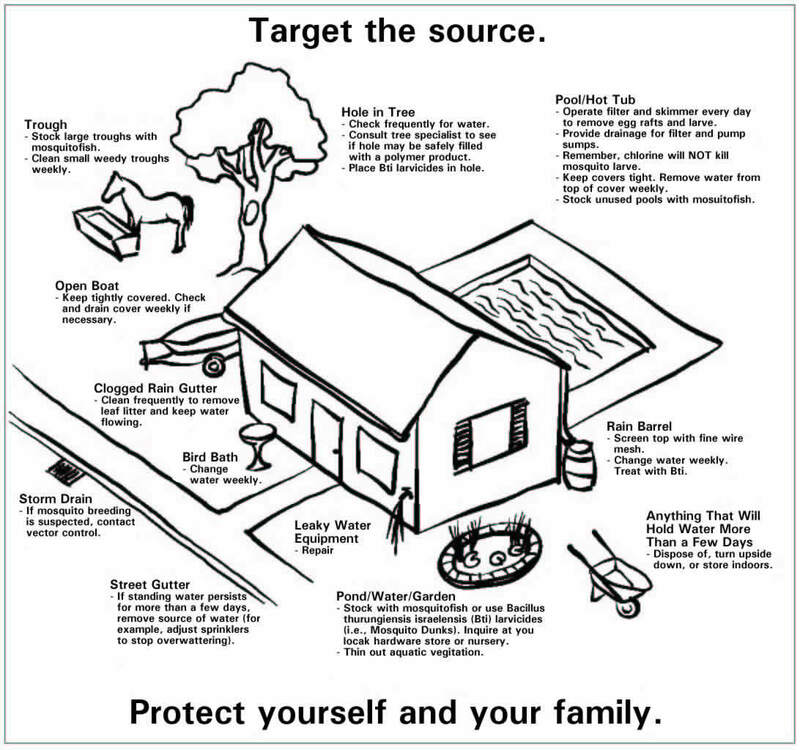 Use the four Ds – Drain, Dress, Dusk, and Defend – to prevent mosquitoes from biting you. *Drain all free standing water. Mosquitoes can lay eggs in less water than fills a bottle cap! Dress in long sleeves and long pants so they can’t bite you as easily. information about times that mosquitoes feed and their flying ranges. Download additional information for your neighborhood, business, school, etc. *If you have large pools of standing water such as ponds and large water troughs, Mosquitofish (Gambusia affinis) can be used as a biological mosquito control instead of using insecticides. These fish are an attractive and effective alternative. Refer to a pet supply store for more information on obtaining compatibility charts and proper care of Mosquitofish. Ornamental ponds should have 6-10 fish per pond (depending on size), out-of-order swimming pools 15-30 fish per swimming pool; the number for animal watering troughs depend on the size of the trough. Ask your supply store for more information if the above dimensions do not provide an adequate example. Hays County Development Services (HCDS) is providing mosquito surveillance within the county to monitor and track mosquito-borne illnesses. Some mosquitoes have the capability to transfer potentially deadly diseases – known as arboviral diseases – to humans. HCDS is collecting mosquitoes in order to determine which areas are harboring disease-carrying mosquitoes. HCDS will set up collection traps to capture samples of several species of mosquitoes that will be sent to the Department of State Health Services in Austin for identification and determination of the type(s) of illness the mosquitoes could be spreading. Monitoring species, mosquito density and geographic breeding sites will provide critical early predictive data to help monitor, prevent and combat mosquito populations and mosquito-borne illnesses. HCDS uses the Centers for Disease Control and Prevention (CDC) gravid-trapping method to collect mosquitoes. This trap is designed to attract female mosquitoes that are ready to lay eggs. The trap uses a fan to draw in mosquitoes that approach the liquid in the bottom of the bucket and keeps them in a collection bag until the trap is collected. Collection is typically carried out from May until November throughout Texas. (Left) A typical CDC gravid mosquito trap. If you see one, please do not touch or disturb it. Hays County will place and monitor 8 traps per week throughout the county during prime mosquito season.